I have an assignment that has two components but produces one grade. I’d like to use a different OAKS rubric to evaluate each component. Is it possible to do this within one OAKS Dropbox so that there is only one grade in the grade book? I really want to keep them as one assignment. The answer is yes and no. The OAKS Dropbox allows the instructor to attach multiple OAKS rubrics to one assignment and use both of them to interactively grade the work. However, it will only automatically load the calculated score from the first rubric. 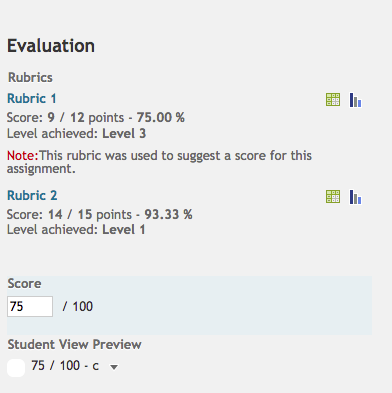 As you can see from the screenshot below, only Rubric 1’s score has been entered into the Score area for the assignment. Two rubrics added and graded. Notice only the first rubric score transferred automatically to the assignment score. You will just need to manually enter the appropriate grade into the Score area, based on the outcome of the two rubrics. The other option to consider would be to create only one rubric in OAKS that has two Criteria Groups. Group 1 is for the first component of the assignment and Group 2 is for the second part. The benefit of using the groups is the you can use different scoring levels per section. Note: this may not produce the same outcome as the two rubrics so be sure to test this before applying it to a live assignment.